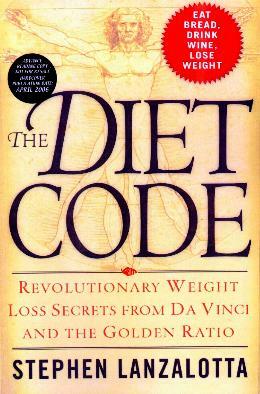 Hot on the heels of The Da Vinci Code comes The Diet Code. "All you have to do is crack The Diet Code - mastering the simple formula that unlocks the secret to easy weightloss; maximizing nutrition and metabolism". Bakery owner/author Stephen Lanzalotta says he's worked out the Golden Ratio proportions: carbohydrate-based, balanced by moderate protein intake, and the inclusion of healthy fats - all inspired by Mr. Da Vinci himself. "It's a provocative yet practical system of nutrition based on an intriguing mathematical phenomenon that's been utilized for millenia but never before applied to nourishing the human body". Lanzalotta's been eating meals made using the Golden Ratio Diet Code for over 20 years. I, on the other hand, don't do math, and find this approach far too complicated and laborious to even consider trying. Math doesn't gel with me so even just looking at it means very little to me. I have enough to worry about than to start trying to remember food codes and macronutrients. His Italian recipes themselves look fine so I'll perhaps try some out. I'll stick to my "all things in moderation" motto and I've already cut out eating in between meals, chocolate (much easier than I thought - my mindset was good at the time and I don't even think about it anymore) and cookies, cut down (much easier to cut down than cut out, initially anyway) on sodas, eat more vegetables, and keep riding my bike and walking. I don't know anyone who's going to be able to code their food - it's just too time-consuming. Just cut out what's not good for you and limit your portions and fill up with water, period. I didn't finish the book as I quickly lost interest. Conclusion - Nice recipes but the rest of the book is too painful to consider implementing into one's life. Life's too short.